Heinrich Ignaz Franz Biber (1644–1704) was one of the most important violinists and composers of the 17th century. Born in Bohemia, and two years in charge at the episcopal court of Olomouc, in 1670 he started to work for the archbishop Max Gandolph von Kuenburg in Salzburg. His sonatas on the rosary are dedicated to the archbishop and cannot be seen as violin sonatas in the ordinary sense, but as a collection of short stories, which are discovered within Anne Schumann’s interpretation. The sonatas are arranged along three topical perspectives: the joyful, the sorrowful and the glorious secrets of the rosary. The interpreters chose three different thuringian churches for the recording. 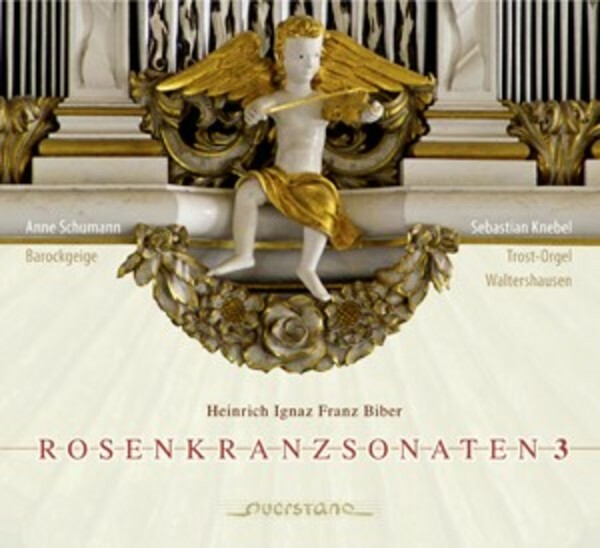 The glorious sonatas were recorded in the impressive atmosphere of the church in Waltershausen with its magnificent Trost organ, Thuringia’s largest organ from Baroque times.